Perhaps you would think that the time for blogging about soup is pretty much over. But two facts conspired to bring it to our table. First, Phil got a little cold, and second, the weather turned pretty nasty. Forecast for Saturday and Sunday: chilly and full-time rain. Great combination for a rotten weekend. I will disclose to you that we do resort to Campbell’s canned soup sometimes. Yes, it’s not that great, but whenever we feel like we might be getting a bit sick, we buy a couple of cans and call them dinner. I squirt a little lemon juice over my bowl, freshly ground black pepper, and it does a reasonably ok job. But, this time I decided to take this classic soup medicine into my own hands. I would start by making my own chicken broth and use that to cook chicken thighs until fork-tender. I won’t be humble. This was one spectacular chicken noodle soup. Even if for my bowl I used zoodles instead. Start by making the chicken broth. Mix all ingredients in a large stockpot or pressure cooker. If using a pressure cooker, cook for 40 minutes under pressure, release steam, open the pan, strain the stock. If using a regular pan, simmer for at least one hour, preferable an hour and a half. Return about 2 cups of broth and 1 cup of water to the pressure cooker, add the chicken pieces seasoned with salt and pepper. Cook under pressure for 20 minutes. Alternatively, simmer in a regular pan until the meat is very tender. Remove the pieces of chicken to a bowl, allow it to cool until you can handle it. As the chicken cools, return the pressure cooker to the stove, add the carrots, celery, cook under pressure for 5 minutes, or in a regular pan until the veggies are tender. The base of the soup is now ready. Shred the chicken with a fork or your fingers. Reserve. Comments: I got the inspiration for this soup from a couple of sources. For instance, the use of kombu in the chicken stock came from the book The Longevity Kitchen. It is an interesting ingredient, one that I advise you to use just like you would fish sauce. Don’t sniff it. Big turn off. But it does a great job, not only nutritionally speaking, but in terms of flavor. The stock made with chicken wings has been my method of choice for years now, after a basic recipe found in one of my favorite cookbooks Simple to Spectacular. I pumped it up by using the pressure cooker, and it does a great job extracting all flavors and goodies from the wings. In the composite photo you can see the color of the stock (upper left), no photoshopping was involved. You will notice that I used the pressure cooker three times in a row, but you can do it all in a regular pan. Make sure to allow the wings to simmer for one full hour at least, and the chicken thighs until very tender. I’ve seen recipes recommending a 10 minute simmer, and I have no idea what those people are talking about. You would have to pretty much wrestle the meat off the bone with such a quick cooking. All in all, this was so good that I had to blog right away. Contrary to what normally happens, you are reading on Wednesday a recipe we enjoyed only three days earlier. Also contrary to my principles, with this post I line two articles in a row involving chicken. Oh, well. That shows you how much I enjoyed this recipe, I simply could not wait to share. I hope you’ll give it a try if you are headed to winter where you live, or if someone is feeling lousy with a cold. 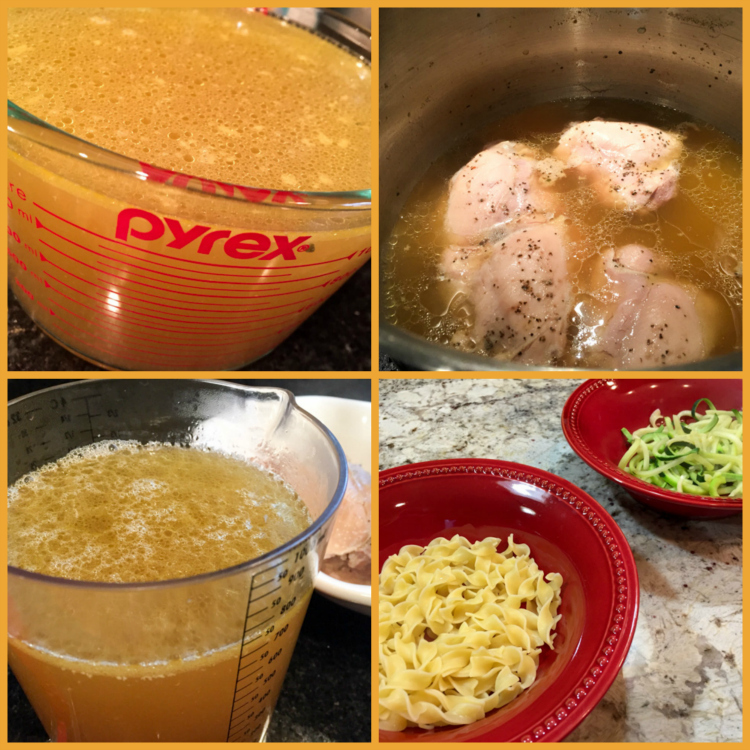 Heck, try it if you simply love chicken noodle soup. No other reason needed! That broth alone sounds delicious! I love broth infused with ginger! I can totally understand your excitement. Another recipe on my list of must tries!!! so many recipes…. so little time….. but it’s all fun! Well, I gotta say Phil is a great patient, he definitely doesn’t behave like the classic “man-sick.” But I hate to see him not feeling well, and yes, he is pretty much recovered, just a little coughing now. i always add a couple chicken feet, they add lots of collagen to the stock. would definitely do that if I found chicken feet – actually I know that the Oriental market usually has it. Now, in the wing broth, the amount of collagen is pretty good too. In fact even the SOUP (not the pure stock) was totally gelled next day in the fridge. And wow, the smell…. this was one great soup. With the price of wings being what it is locally, I wouldn’t use them for stock … thighs yes, and chicken feet and of course, a chicken carcass but the soup itself, sound delicious with the seaweed and the ginger. amazing, they are quite cheap here! People love to serve them as appetizers in football games, sports events, you can get full trays with dozens of them lined up. I can see how they could be expensive in other places, and of course, no bueno for stock! As the weather starts to turn cold, my thoughts run to hearty soup and this one is SOO good!! 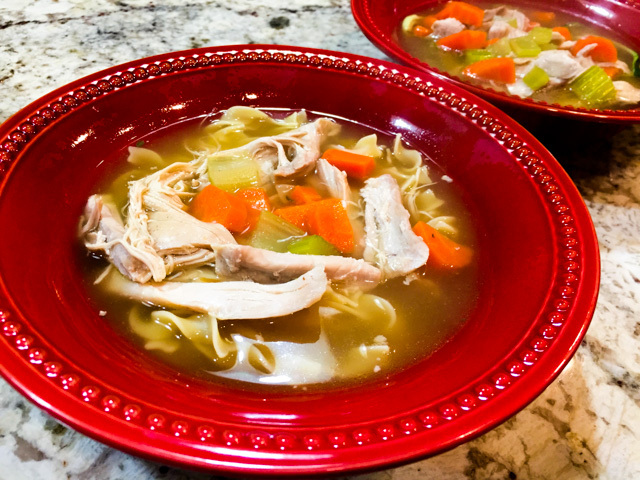 Always nice the chicken noodle soup… I find myself craving some again, even though today it will be 25 C here… can you see me doing the Happy Dance in flip flops? Can you? Great soup Sally, I cooked my noodles right in the broth along with veggies, They only take about 6 minutes to cook. Made a 6 qt, Dutch Oven full. Will have a few lunches to enjoy! Ginger always helps make you feel better! I could definitely use a good chicken noodle soup recipe. ginger is an amazing addition to almost any recipe! sweet and savory… love it!